Before we get started, I want to take a minute and let you all know about my recent interview with PJ Kwong on Open Kwong Dore podcast! I recently had chance to talk everything from skating to drag to bullying with PJ (who is really the voice of Canadian figure skating) and it was just a lot of fun. For those of you who may enjoy the blog itself but might not know much about me personally, give it a listen! We talk about some interesting stuff. Now... I can't think of a better way to get Canada Month rollin' on the river on Canada Day than with the first of several articles coming this month about Canadian skating history. I decided to take a look at the life of Norval Baptie. 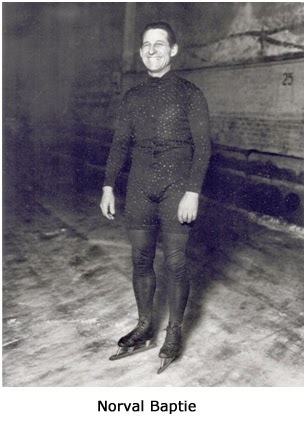 Born March 18, 1879 in Bethany, Ontario, a small village of less than three hundred in the Township of Manvere County, Durham, Norval was a pioneering force in figure skating and a real 'father' of the ice show, although many have never even heard his name. From 1894 to 1910, Norval was a competitive speed skater who was unbeaten for sixteen years in his sport, winning almost five thousand races and setting records for broad jumping on skates, barrel jumping, skating backwards and skating on stilts. He turned his attention, however, to stunt and figure skating, and toured Canada and the Northern U.S. with a one man show that was a pioneering movement in presenting figure skating to audiences as a form of entertainment. He recounted his story in 1966, which was reproduced with much of the information found in this article in David Young's fantastic 1984 book "The Golden Age Of Canadian Figure Skating": "The show consisted of seven acts. First, I would help the ticket taker at the gate. Then I would loosen up with an exhibition of speed skating, just to get some of the 20 to 30 below (F) weather out of my bones... A fox chase usually followed with as many as fifty local youngsters skating their heads off in an effort to catch me. I would then jump some barrels, and in some of these towns, they had kids who were pretty handy at this, and they wouldn't be satisfied until you upped the number to exceed their best efforts. This would be followed with an exhibition of figure or fancy skating. The finale usually consisted of a stilt-skating exhibition, and mine usually measured twenty-six inches, although most of those used by today's spectacular acts are only fourteen inches high." Norval's pioneering efforts and exhibitions - not only of figure skating but of barrel jumping on skates and skating on stilts - became staple acts in tours like Ice Follies, Ice Capades and Holiday On Ice that were to come. He shared his passion for figure (or "fancy" skating) in a 1929 interview with the New York City Public Schools Athletic League Annual: "... at this point I might say a good word for fancy skating. Few activities add so much to the grace and build of a man or a woman as does fancy skating for the benefit of those who might like to take it up. The gyrations, bending, twistings and curves of fancy skating give one more healthful exercise than any number of daily dozens." 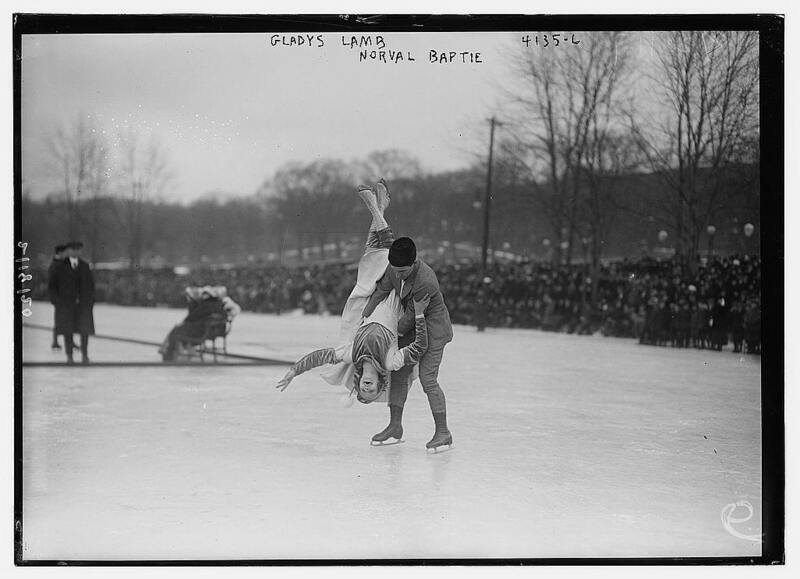 After World War I ended near the end of the second decade of the 1900's, Norval expanded his shows to a format that was to better be known to skating audiences to come, employing other acts and joined both on and off the ice by Gladys Lamb, a dancer turned skater from Chicago, Illinois who he married in 1924. Norval directed skating carnivals featuring three time Olympic Gold Medallist Sonja Henie and in 1938, retired from performing and moved to Washington, D.C. to coach skating at the Washington Figure Skating Club. At the club, he worked alongside 1936 and 1937 Canadian Figure Skating Champion and renowned coach Osborne Colson, who described Norval as "one of the most remarkable men that I had ever met". Norval really was remarkable, not only for his pioneering efforts in the sport, but for the fact he continued to coach after having both legs amputated within a four year span due to complications with diabetes, teaching skating from a wheelchair until his death at age eighty seven on November 26, 1966 in Baltimore, Maryland. In a fabulous Pro Skating Historical Foundation article written by the late Janet Wright, Shirley Sherman recounted being taught by him: "Back in those days Norval was the only coach in the Winter Garden. [It was] open in September until sometime in the spring. He looked grumpy but was very gentle with me. In the earlier 30's there weren't many little kids figure skating. I think he felt sorry for a little girl struggling around school figures!... I only remember Daddy having complete faith in him." Having pioneered the ice show, entertained audiences in cities and towns across North America and taught so many skaters how to skate, Norval lived a remarkable and impacting life. He was named to the United States Ice Skating Hall Of Fame prior to his death and his pioneering efforts live on in the ice shows and skaters of today. He paved the way. And with that... Happy Canada Day!